This slip n dip is fast and fun. It gives you the opportunity of enjoying a cool refreshing mist all the way down and then it ends with a cool refreshing splash in the pool. Book this unit early it is out all summer long. You will need to supply a garden hose and water. 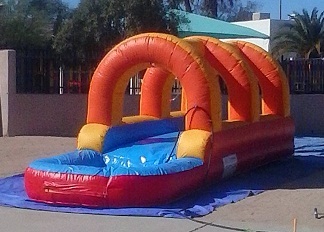 JumpMaxx prides ourselves in providing America with newer, cleaner, high end entertainment with inflatables like the Slip n Dip and many others.